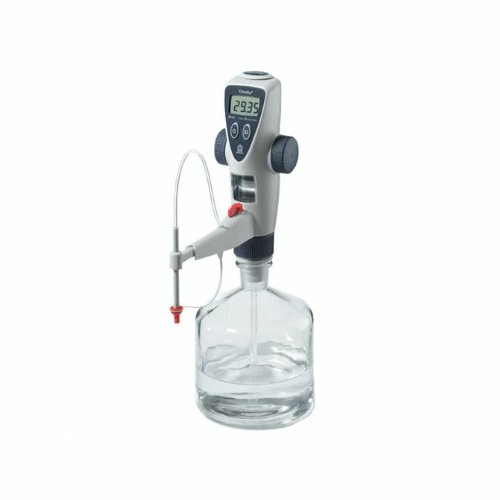 The 25ml Titrette is the new generation of Bottletop burette from BRAND and is available with an RS232 interface for direct transfer of data to a PC. 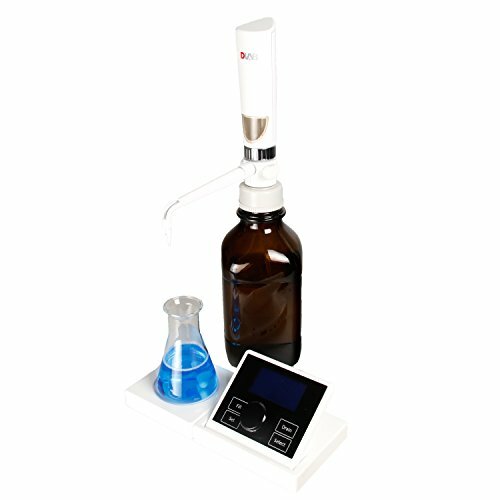 It has a number of innovative features and upgrades for more accurate and convenient titration. 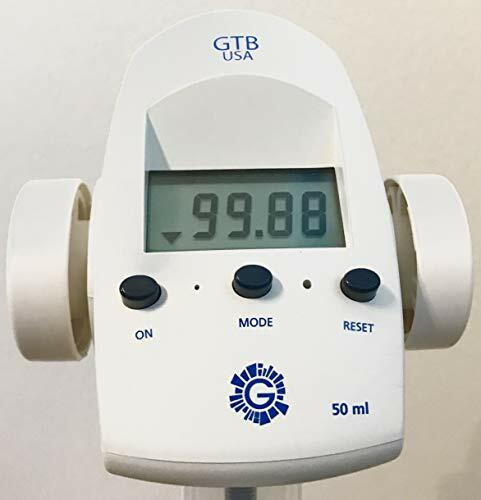 The Titrette Bottletop burette has an innovative new measuring system which matches the Class A accuracy of glass burettes and, if needed, can offer the precision of 3 decimal places below 20mL. This is an important feature for users who need to work within the Class A error limits of glass burettes according to DIN EN ISO 385 or within volumetric tolerance per ASTM E287. The Titrette can be quickly and easily disassembled in a matter of minutes for cleaning, to replace the piston/cylinder, or to replace the batteries. Maintenance is easy and convenient, without the need to send it out for repair. To protect light-sensitive media, the installed clear cylinder inspection windows can be easily replaced with the supplied clip-on amber-colored windows. All components move within the housing, reducing headroom requirements. The compact design and the light weight ensure good stability. The titrating tube can be adjusted horizontally and vertically. The large hand wheels provide smooth, precise control from rapid to drop wise titration. It is suitable for most commonly used titrants up to 1mol/L in concentration, such as potassium permanganate, silver nitrate, EDTA, sodium hydroxide and alcoholic potassium hydroxide. Computer interface: Available with an RS232 interface for direct transfer of data to a PC. Capacity: 25ml. Per each. BrandTech #: 4761251. This 50ml piston head is designed for use with the BRAND Titrette Bottle top burette. Size: 50ml. Per each. BrandTech #: 707532. Titrant delivery is controlled by turning wheels on buret. The amount dispensed is instantly displayed from to 0.01 ml to 999.9 ml. A direct connection to the reagent bottle avoids pouring dangerous chemicals. The safety recirculating valve eliminates reagent waste during the initial priming of the buret. Continuous pulse-free vibrations proved faster titrations, up to 5 mL per second. Telescopic filling tube adjusts to fit reagent bottle wtihout cutting and can be readjusted for other bottle sizes. 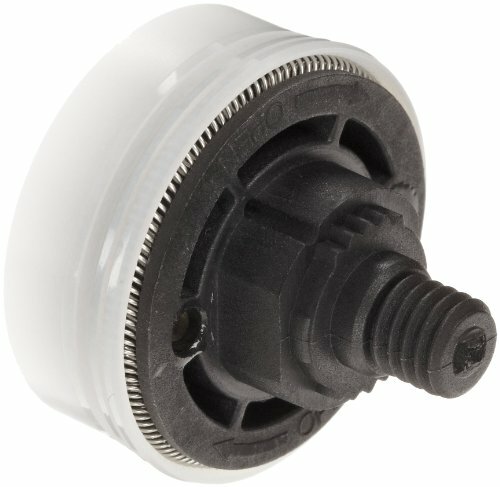 The safety pedestal valve allows the Digitrate fluid path to be turned off manually to prevent accidental delivery. Its rightangled spout is also designed to enhance safety in use, particularly when dispensing into narrow neck containers. Digitrate's robust outer casing does not move during the priming or dispensing sequences whilst its PTFE plunger and borosilicate glass barrel allows dispensing of aqueous solutions and some aggressive liquids. you can replace the glass barrel as a spare part rather than have to buy a new digital burette. A titration unit with a reagent recirculation system for manual titration directly from the reagent bottle. Power supplied by a solar cell. Advanced energy concept, precision results - sets standards as the world's first digital burette with integrated solar cell. The power supply for the electronics and display is derived exclusively from an integrated solar cell. Batteries can be completely dispensed with. Easily replaceable valves, individual calibration with "Quick-Cal" and permanent storage of the manufacturer's calibration facilitate rapid and flexible adaptation. The vivid digital display prevents meniscus reading errors and is always clearly legible, regardless of the viewing angle. The handwheels with soft touch surface are ergonomically optimised for particularly precise control. 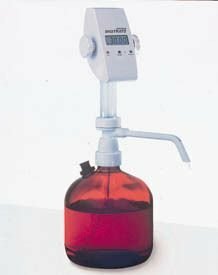 The 50ml Titrette is the new generation of Bottletop burette from BRAND and is available with an RS232 interface for direct transfer of data to a PC. 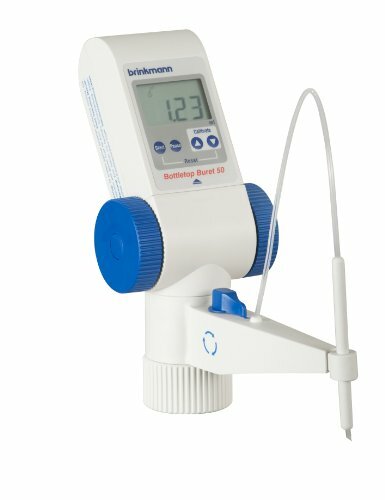 It has a number of innovative features and upgrades for more accurate and convenient titration. 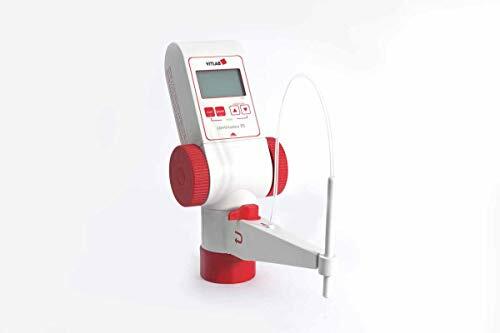 The Titrette Bottletop burette has an innovative new measuring system which matches the Class A accuracy of glass burettes and, if needed, can offer the precision of 3 decimal places below 20mL. This is an important feature for users who need to work within the Class A error limits of glass burettes according to DIN EN ISO 385 or within volumetric tolerance per ASTM E287. The Titrette can be quickly and easily disassembled in a matter of minutes for cleaning, to replace the piston/cylinder, or to replace the batteries. Maintenance is easy and convenient, without the need to send it out for repair. To protect light-sensitive media, the installed clear cylinder inspection windows can be easily replaced with the supplied clip-on amber-colored windows. All components move within the housing, reducing headroom requirements. The compact design and the light weight ensure good stability. The titrating tube can be adjusted horizontally and vertically. 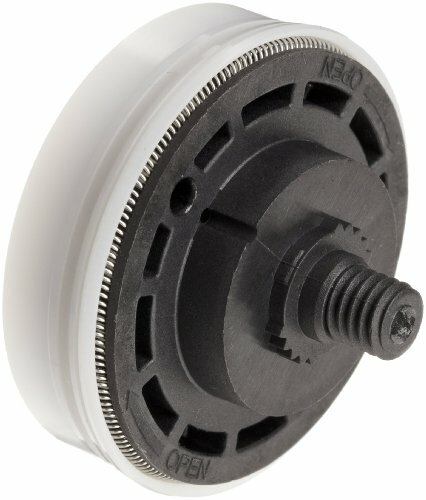 The large hand wheels provide smooth, precise control from rapid to drop wise titration. It is suitable for most commonly used titrants up to 1mol/L in concentration, such as potassium permanganate, silver nitrate, EDTA, sodium hydroxide and alcoholic potassium hydroxide. Computer interface: Available with an RS232 interface for direct transfer of data to a PC. Capacity: 50ml. Per each. BrandTech #: 4761261. This titrating tube is designed for use with the BRAND Titrette Bottletop burette. The titrating tube can be adjusted horizontally and vertically. This provides flexibility when positioning the instrument, e.g., when using a magnetic stirrer or different bottle sizes. It comes with screw cap and integrated discharge and recirculation valve. Per each. BrandTech #: 707526. This 25ml piston head is designed for use with the BRAND Titrette Bottletop burette. Size: 25ml. Per each. 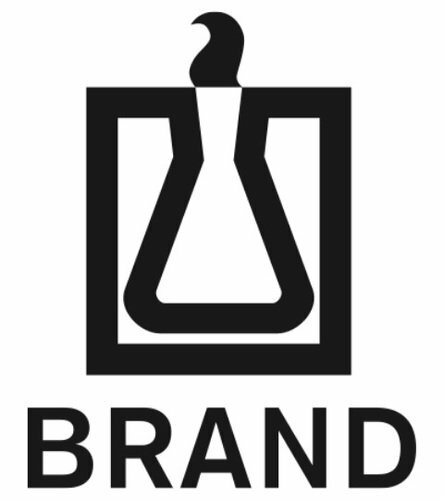 BrandTech #: 707530. 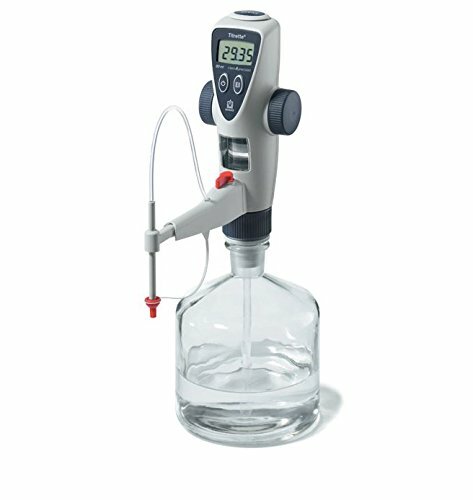 The Jencons Digitrate Pro Digital Burette is an accurate, convenient bottle-top titration instrument that combines optimal user safety and streamlined priming and dispending of aqueous solutions and other aggressive liquids. A safety pedestal valve distinguishes the Pro digital burette from others, which allows the fluid path to be turned off manually to limit accidental delivery. A right-angled spout adds to the safety of this instrument. 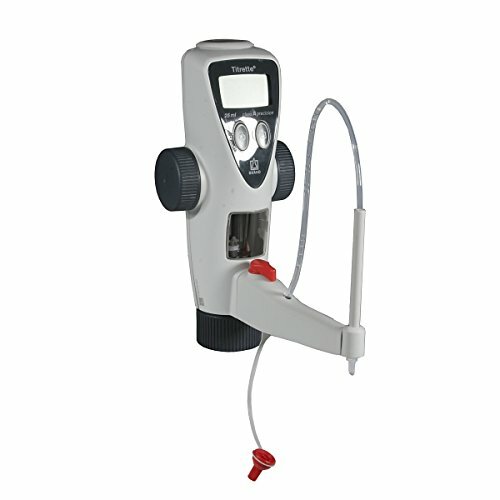 A continuous LCD display constantly updates the user with volume changes, while the PTFE plunger and barrel dispense the liquid. The barrel is made of borosilicate glass that is protected with a transparent polypropylene sleeve that acts as a visible inspection tool, monitoring liquid before dispensing into a bottle. Besides being both chemically resistant and autoclavable, the burette's head can be rotated 360 degrees, while the transparent barrel ensures bubble-free titration. It is powered by a lithium 3.6V battery that gives the burette a minimum life of 60,000 three-minute titrations. The Digitrate Pro also has a static mode that kicks in when left unattended, and automatically switches back on to reflect the previous titration volume. With a +/- 0.2 accuracy and a precision better than 0.1%, this accurate, powerful Digitrate Pro burette is manufactured to meet ISO 9001:2000 accreditations, and a calibration certificate is supplied with each unit.